As our children grow and find their independence how do we grow in this new phase of empty nest? What new relationships will we create with our adult children? A recent family visit has set me to thinking about how we grow in our relationships with our adult children. We call this the empty nest phase…the kids grown and on their own. I remembered that I had written an article about empty nest two years ago. I was surprised by the passage of time and wondered what I would be able to expand upon. It occurred to me that for starters, I continue to add my own experience, as Mom and now as Grandmom. The truth I discovered was that hopefully as our children and then adult children grow, we grow too. My sons will always be my sons. I will always have worries or concerns fueled by my wish that they are well, happy and fulfilled in their lives. BUT…as much as my instinct to protect and shield them from hurt and harm is alive and well, I also know that their continuing growth and experiences are not in my control, nor should they be. The same things that are worries and concerns are also the things of pride and awe when I see them navigating their ups and downs of life with strength, resilience and positive outlook. I don’t feel shut out or irrelevant as they share what’s going on and appear to want a listening ear and maybe some feedback. They don’t require or need me to put on a band-aid or feed them chicken soup, but they do need me to hear them. In the spirit of this point in our relationship, I share with them as well. I want them to see me as an adult, just as they are. I want to share with them my trials and triumphs too. If I do happen to slip into talking to them as if they are eight or nine…I need to remind myself that they are not! Oftentimes I wish there was a better term to describe grown children. Now we are all adults and it is important for our relationship to reflect that. This label of “adult children” feels like a contradiction. Their growing and my growing is all a process…step by step, year by year, milestone by milestone. So here is my revisited look at empty nest and lessons in letting go. Perhaps you will connect to my reminiscence and find some thoughts that resonate with you at whatever stage of empty nest you are in. My son took my hand. I could feel his eager and anxious anticipation. We started out together on that walk to school. It was the first day of KINDERGARTEN! Where had the time gone? No longer my baby or toddler, my little boy was growing up. I was anxious, just like my son. How would this first day be for him? I yearned for it to be just right. I fervently wanted to protect him from any and all of those school time hurts. Emotions of sadness and excitement, joy and fear fought within me. On the outside, I was calm, supportive and encouraging as a parent is “supposed” to be. Fast forward thirteen years later. It was again time for another milestone and letting go. COLLEGE! That summer had been a whirlwind of graduation celebration, preparation and packing. Here we were at last, in a postage sized dorm room. Everything had been brought in. It was time to say good-bye. We shared the same eager and anxious anticipation, just as on that first day of kindergarten. Again that sadness of letting go mingled with anxiety and pride in seeing my child come to this new rite of passage. I was apprehensive about my son’s adjustment and my own as well. What would our relationship be like now? How was my identity changing in response to the house being quieter and emptier in his absence? I was entering that empty nest phase and I couldn’t believe how I had gotten there! Kindergarten and College, the years in-between and the years beyond, are all so vivid and fresh in my mind. The gift of letting go so that a child can spread his or her wings is one that parents need to give over and over again. A mother’s fierce desire to protect is at odds with the necessity of letting go so that her child can grow. The summer is waning now. Vacation time is just about to end. New beginnings are fast approaching. 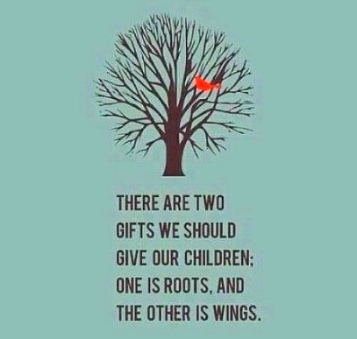 Wherever you are in this spectrum, it is a time of knowing you have provided your child with the roots of responsibility, values and support so they can spread their wings and fly independently. Here are some tips to help you make your own passage as you see your child or children make theirs. your time of self-discovery, just as it is for your child. of new connections to your child. avenues of bonding and conversation. child is in his or her life journey. What has helped you in your journey of parenthood? Where are your strengths and where are your roadblocks? Let’s have a conversation about it. .What do you think? Join our discussion on my website!